Our 926 women's stretch lifeguard board short offers the same outstanding tailored fit, and modern styling as the Men’s 928 board short. Made by Water Safety Products in the USA, our Lifeguard Stretch Board short is constructed of a robust 4-way Poly-stretch fabric with a DWR (Durable Water Repellent) finish for quick drying and oil/chemical repellency. 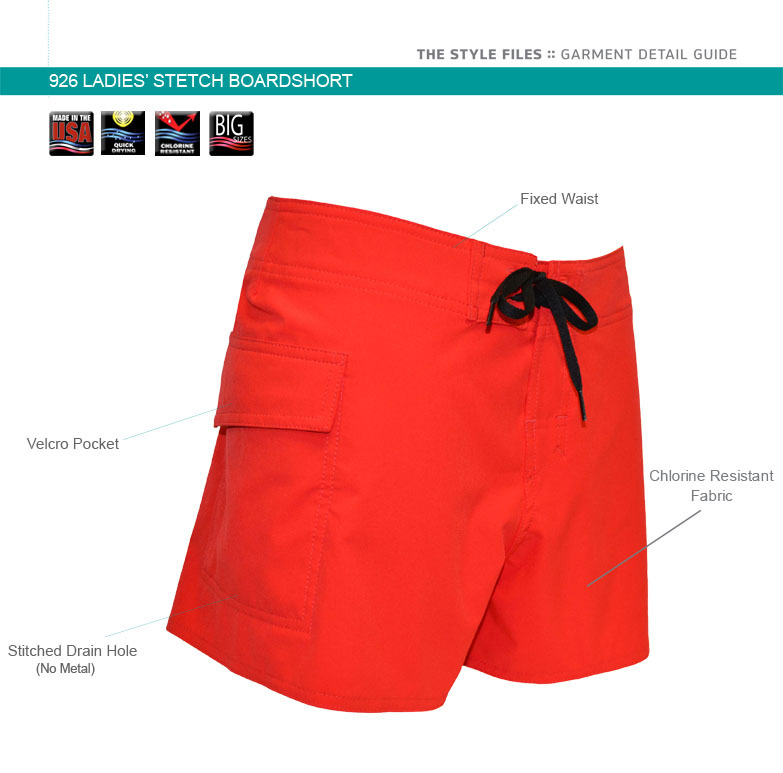 The 926 is a fixed waist board short with drawstring and a Velcro-free fly for a secure fit and increased comfort. The right leg features a draining large cargo pocket, plus a key loop. The women's lifeguard short is slide safe and has no metal or plastic components. You can customize your team shorts with your facility’s logo on the left leg. Waist 24"-25" 26"-27" 28"-29" 30"-32" 33"-34 35-36" 37-38"